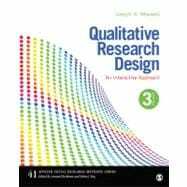 Qualitative Research Design: An Interactive Approach, Third Edition provides researchers and students with a user-friendly, step-by-step guide to planning qualitative research. Joseph A. Maxwell shows how the components of design interact with each other, and provides a strategy for creating coherent and workable relationships among these design components, highlighting key design issues. Written in an informal, jargon-free style, the book incorporates examples and hands-on exercises.